Note: Double bottom ballast tanks, 3 watertight bulkheads, steam pumps. Globe Iron Works, Cleveland, OH. 24, 39 & 63 x 42", 1,300hp @ 85rpm engine. Two 15'4" x 11'6" scotch boilers, Marine Boiler Works, Toledo, OH. Port Weller, ONT dry dock. 1894, Oct 16 Enrolled Cleveland, OH. 1896 Chartered to Great Lakes Steamship Co, Buffalo, NY; ran Buffalo, NY - Cleveland, OH & Manitowoc, WI. 1898, Nov 28 Collision with steamer COLGATE, Duluth, MN. 1899, May 11 Owned Bessemer Steamship Co., Cleveland, OH; converted at Cleveland to bulk freighter, iron ore trade; 400.42 x 42.66 x 24.25', 3746 gross / 2970 net tons; renamed JAMES B. EADS. 1901 Owned Pittsburgh Steamship Co, Cleveland. 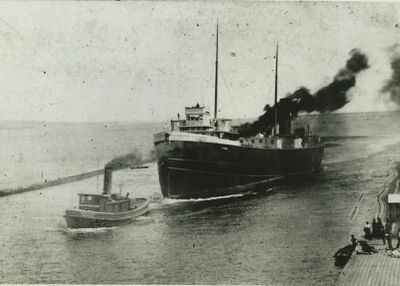 1915, Jun 7 Collision with freighter Chicago, St. clair River; received two new watertube boilers. 1920 Reconstructed, 2704 gross / 1610 net tons, 1 deck, arch construction. 1926 Owned Nassau Ship & Dredge Co., Chicago, IL. 1927 Owned Midland Steamships Ltd, James Playfair, manager, Midland, ONT; C153126. 1934 Owned Gordon C. Leitch, Toronto, ONT. 1935 Owned Norris Steamships Ltd., Toronto. 1940 Owned Upper Lakes & St. Lawrence Transportation Co, Ltd, Toronto. 1960 Owned Upper Lakes Shipping, Ltd, Toronto; diesel crane added. 1960, Sep 30 Collision with craneship WILLIAM H. DONNER, Toledo, OH; repaired Port Weller. 1963 Owned A. Newman & Co, St. Catharine's, ONT, for scrapping.